For breaking news and to join the conversation, check out our Twitter account! Shaefer, Jame. "New Hope for the Oceans: Engaging Faith-Based Communities in Marine Conservation." Frontiers in Marine Science. 14 March 2017. Schaefer, Jame and Susan Higgins. "Best Practices Survey – Promising First Step toward Developing Guidelines." December 2016. Rutte, Claudia. 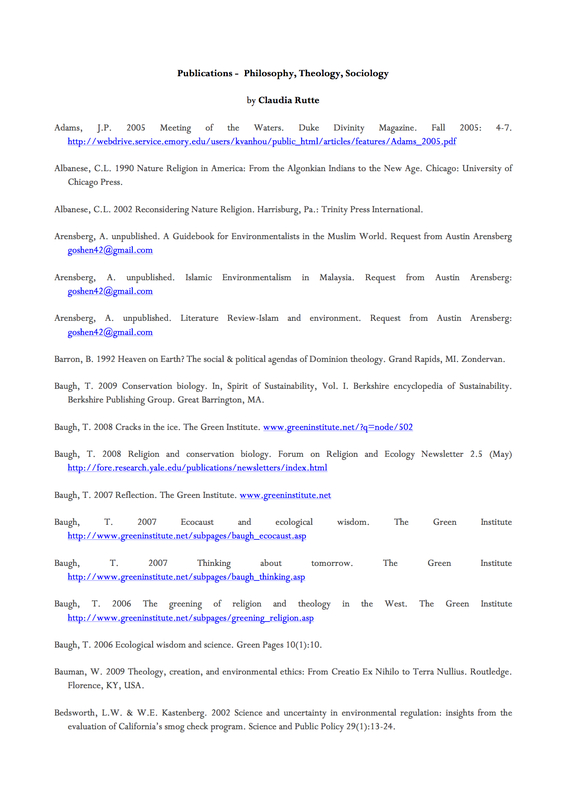 List of Publications on Philosophy, Theology and Sociology. International Congress for Conservation Biology 2019. 21- 25 July 2019. Kuala Lumpur, Malaysia. 2017 Rome-Assisi Conference on Spirituality & Sustainability. 27 June - 4 July 2017. Rome and Assisi, Italy. International Congress for Conservation Biology. 23-27 July 2017. Cartagena, Colombia. 5th International Marine Conservation Congress. 24-29 June 2018. Kuching, Sarawak, Malaysia. Jackson, Wendy, and Alison Ormsby. "Urban sacred natural sites–a call for research." Urban Ecosystems: 1-7. June 2017. Singh, Khushwant and Judith Steinau Clark. Voices from Religions on Sustainable Development. German Federal Ministry for Economic Development and Cooperation. 3rd edition. April 2017. Bennett, Nathan, Robin Roth, Sarah C. Klain, Kai M.C. Chan, Douglas A. Clark, Georgina Cullman, Graham Epstein, Michael Paul Nelson, Richard Stedman, Tara L. Teel, Rebecca E.W. Thomas, Carina Wyborn, Deborah Curran, Alison Greenberg, John Sandlos, Diogo Verissimo. Mainstreaming the social sciences in conservation. Conservation Biology 33:1, 56-66. February 2017. McKhann, Charles. Crimes Against Nature: Kincest, Cosmology, and Conservation in Southwest China. Anthropological Forum. 1 February 2017. Bhatia, Saloni, Stephen Mark Redpath, Kulbhushansingh Suryawanshi and Charudutt Mishra. The Relationship Between Religion and Attitudes Toward Large Carnivores in Northern India? Human Dimensions of Wildlife 22:1. 2017. Verschuuren, Bas, and Naoya Furuta, eds. Asian Sacred Natural Sites: Philosophy and practice in protected areas and conservation. Routledge: Abingdon and New York. 2016. Guynup, Sharon. Exclusive: Tiger Temple Accused of Supplying Black Market. National Geographic. 21 January 2016.